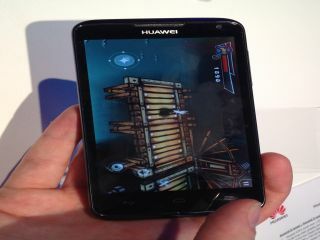 The Huawei Ascend D series smartphone has been shown at MWC 2012, and speed is the name of its game. In a marketplace that's getting more crowded than a mid-August commuter train in Stratford, Huawei has its work cut out. Differentiation is now seen as the key to success in the smartphone world and, like Fujitsu, Huawei has opted to fight on power, rather than looks. But, picking up the D Series for the first time, you're struck how similar it is to the Samsung Galaxy S2 and Samsung Galaxy Nexus. The handset itself is light, weighing about the same as the Nexus, and is clad in a thin black plastic covering, which does little to impress. The power comes in the form of the Texas Instruments based OMAP4460 1.5GHz quad-core processor and it does its job. The phone feels slick when navigating Android 4.0 Ice Cream Sandwich, especially when using the camera. You're able to get really trigger happy and the image capture and processing is done in the blink of an eye. But more on that later. We're not sold on the need for a quad-core handset at this moment in time, and we'd rather see significant gain in screen size, battery life and quality of the camera. However, the quad-core CPU really makes a difference here. Just like the tangible feeling of immediacy and responsiveness you get from the Tegra 3 Asus Eee Pad Transformer Prime over dual-core tablets. In the press conference, Huawei's Richard Yu stated than the quad-core processor at the heart of the Ascend D Series was between 30% and 50% faster than Tegra 3, though there seems no real-world difference in use. One of the Ascend D Series' big stories is power consumption, and Huawei promises days of battery life. Longevity is impossible to test on a unit which is security tagged and minded by heavies, but one of the key boasts was power efficiency through cool-processing. However, from our time with the D Series, we're very skeptical. The handset felt uncomfortably warm in our hands as we loaded web pages and video, more so than any other smartphone we've seen. We'll only know when the full review units debut in April. Picture quality was a key part of Huawei's announcement, and the 8MP sensor treads water with most of today's handsets, but is no world-beater. The picture quality was good, even in low light, and thanks to the processor, we were able to quickly focus and shoot. The quality of the shots was average, with noise visible on close inspection, and weren't as good as the iPhone 4S with its excellent built-in 8MP snapper. Huawei is to be applauded for packing a 1280 x 720 4.5-inch screen into such a small phone, and no space is wasted. We'd have liked to have seen an AMOLED display, which really sets the likes of the Samsung Galaxy Nexus and Nokia Lumia apart, yet the picture was vibrant, thanks to Huawei packing in a few more pixels per inch (330 to be precise rather than 326 on the iPhone 4S). But we'd forgo that for the vibrant mind-rainbows produced by the Nexus. The Huawei Ascend D Series release date is April 2012 in Europe.